It is well known that it can be difficult or downright impossible to get a concealed carry permit in some counties of California. 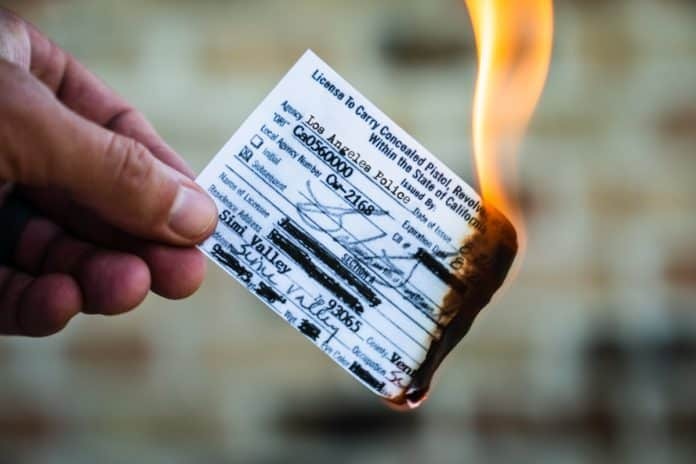 Being one of the few “May Issue’ states, it is up to the local Sherriff or police chief to decide if they will accept your “good cause” statement and issue you California License to Carry. 36 Counties with self-defense or minimal good cause required. 10 Counties with moderate good cause required. 2 counties with heightened good caused required. 4 counties with exceptional good cause required. 6 counties that virtually issue no licenses. So if you are planning on moving to California, you may want to choose your county wisely if you want to get a California concealed carry permit. The City of Los Angeles settled the lawsuit in 1995 and issued the 30 plaintiffs a California License to Carry. He also goes on to state that the crime rate is down and there are more police officers on the streets, so the level of danger to an average person has been reduced. With a quick Google search, I found Los Angeles to have an average police response time of 5.7 minutes. A lot can happen in 5.7 minutes. I was on the set of First Person Defender last week, and while these are just scenarios, you can see how quickly things can turn bad. Or head over to Active Self Protection where they do after-action reports on real-life self-defense situations. I’d rather be armed and prepared to defend myself versus waiting for the police to show up 5.7 minutes too late. Previous articleStop Carrying Concealed with an Empty Chamber!